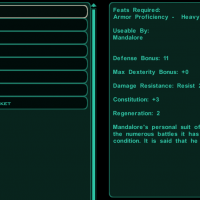 This mod adds eight new items with unique properties and are restricted to each of the human and humanoid party members in KotOR II: TSL, including Atton, Bao-Dur, the Disciple, the Handmaiden, Kreia, Mandalore, Mira and Visas. Said party members will automatically have these unique outfits equipped when they join your party. 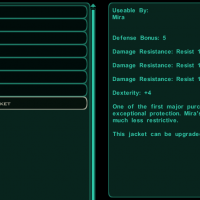 Each of these outfits also has its own custom inventory icon and can be upgraded. 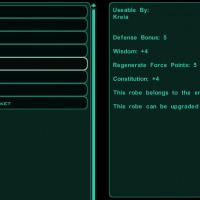 If you want to see your party members appear in their default outfits and those outfits being more useful in combat throughout the course of the game, this mod is for you. For the best experience with this mod, it's recommended to have a completely new TSL playthrough. 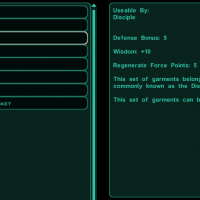 The idea of this mod was inspired by jonathan7's Party Clothing mod for KotOR 1. 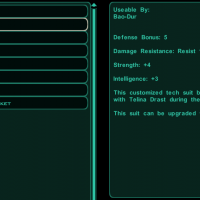 While jonathan7 had also made a similar mod for TSL as part of the Force Fashion II mod, I don't use Force Fashion II because it is not compatible with TSLRCM. Therefore, I decided to make my own version of a similar mod for TSL. 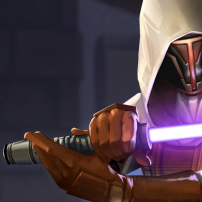 Technically, this mod was my first attempt at KotOR modding. However, initially this mod was only for my personal use. Now I have decided to release this to the public. 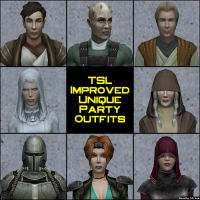 Extract the TSL Improved Party Outfits.zip you downloaded to anywhere you like, as long as it is not within the KoOR 2 directory. 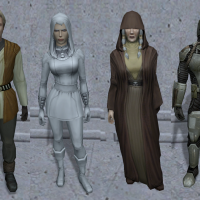 Run Install TSL Improved Party Outfits.exe, point the installer to your KotOR 2 directory and let the installer do its magic. 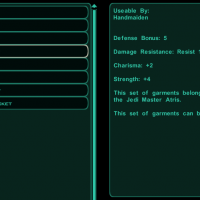 This mod also provides an optional file that improves Handmaiden's Robe to have the same stats as the Handmaiden's default outfit from this mod. If you want to install the improved Handmaiden's Robe, go to the "Optional - Improved Handmaiden's Robe" folder, copy a_robe_x01.uti and paste it in your Override folder. NOTE: If you already have the .utc files of the humanoid party members in your Override folder (the file names are p_[party member name].utc), when you install this mod a new folder named "backup" will be created by TSLPatcher in the same folder as the TSLPatcher. Do not delete the folder or any of the files within the folder if you are planning on uninstalling this mod. Go to your Override folder, delete ia_Class9_201.tga, the .tga files starting from ia_cloths_202.tga to ia_cloths_208.tga and the .uti files with the "llk_" prefix (without the quotation marks). 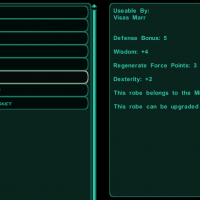 If you also installed the Improved Handmaiden's Robe from this mod, go to your Override folder and delete a_robe_x01.uti. If a "backup" folder was created when you installed this mod, go to the "backup" folder, cut and paste any .utc. file(s) from the folder and paste the file(s) in your Override folder. If no backup folder was created, simply delete p_atton.utc, p_baodur.utc, p_disciple.utc, p_handmaiden.utc, p_kreia.utc, p_mand.utc, p_mira.utc and p_visas.utc from your Override folder. None currently known. If you find any bugs or problems, please let me know. If you want to use any other mods that modify the above files, AND the other mod uses the "putting the files in Override folder" method to install, you need to install this mod AFTER the other mod. The optional Improved Handmaiden Robe component is not compatible with any other mods that modify the .uti file of Handmaiden's Robe (a_robe_x01.uti). 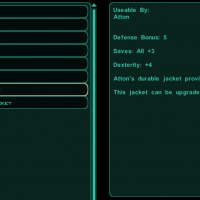 This mod should be compatible with any reskin mods for the party member's default outfits, as long as they don't edit the abovementioned .utc files of the party members. You may modify this mod for your personal use. However if you want to use any files from this mod for your own mod, please ask for my permission before releasing your mod. If I give you permission for it, I request that you credit me when you release your mod. Thank you. I do not use nor support Steam Workshop, so I do not wish any of my mods to be uploaded to Steam Workshop. THIS MODIFICATION IS NOT SUPPORTED BY BIOWARE/OBSIDIAN ENTERTAINMENT OR LUCASARTS OR ANY LICENSERS/SPONSORS OF THE MENTIONED COMPANIES. USE THIS FILE AT YOUR OWN RISK AND NEITHER THE ABOVE MENTIONED COMPANIES NOR THE AUTHOR IS RESPONSIBLE FOR ANY DAMAGE CAUSED TO YOUR COMPUTER FOR THE USAGE OF THIS FILE.